The keynote address will be given by United States President Donald Trump. Prime Minister Narendra Modi will address the opening plenary at the World Economic Forum's Davos summit next week, while the keynote address will be given by United States President Donald Trump at the annual jamboree of the global elite to be attended by 70 state heads. Besides, 38 heads of major international organisations such as the World Trade Organisation, the International Monetary Fund and the World Bank, as also nearly 2,000 CEOs including over 100 from India will be present at the five-day WEF Annual Meeting 2018, beginning on January 22 with a welcome reception to be hosted by India. Announcing the official programme in Geneva today, the WEF said the summit will see the largest ever engagement of global leaders this year where the key talking points would include international security, environment and the global economy. The theme of the meeting, spread over 400 sessions, would be 'Creating a Shared Future in a Fractured World', while the meeting would also see the largest ever proportion of women leaders (21 per cent) including all co-chairs being women this time including social entrepreneur Chetna Sinha from India and IMF's Christine Lagarde, the WEF said. Modi will be accompanied by six union ministers, including Finance Minister Arun Jaitley, Piyush Goyal, Suresh Prabhu, Dharmendra Pradhan, M J Akbar and Jitendra Singh. Besides, two chief ministers (Devendra Fadnavis and Chandrababu Naidu) and over 100 CEOs would take India's total presence to 129 -- the fourth highest after the US (780), the UK (266) and Switzerland (233 people). China will have 118 participants. Women participants would account for 12 per cent of total Indian presence, compared to 27 per cent from the US, 24 per cent from the UK, 22 per cent from Germany, 20 per cent from Switzerland, 19 per cent for China and 18 per cent for France. The WEF said its 48th Annual Meeting will focus on finding ways to reaffirm international cooperation on crucial shared interests, such as international security, the environment and the global economy. The meeting comes at a time when geostrategic competition among states is generally seen to be on the rise. Alongside international cooperation, an additional priority of the meeting will be to overcome divisions within countries, said the WEF which describes itself as an international public-private organisation focussed on improving the state of the world. The WEF said divisions have often been caused by breakdowns in the social contract as a result of failure to protect societies from the transformational impacts of a succession of shocks, from globalisation to the proliferation of social media and the birth of the Fourth Industrial Revolution. "Collectively, these shocks have caused a loss of trust in institutions and damaged the relationship between business and society," it added. "Our world has become fractured by increasing competition between nations and deep divides within societies. Yet the sheer scale of the challenges our world faces makes concerted, collaborative and integrated action more essential than ever," WEF's Founder and Executive Chairman Klaus Schwab said. He further said the summit aims to overcome these fault lines by reasserting shared interests among nations and securing multistakeholder commitment to renewing social contracts through inclusive growth. 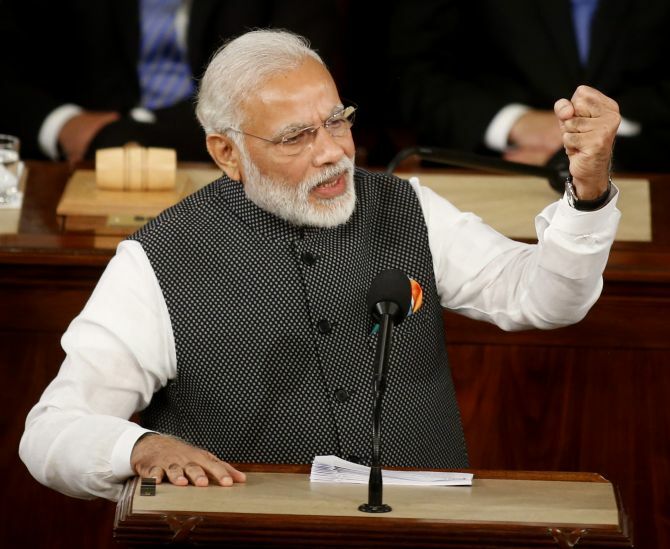 This year's opening plenary will be delivered by Modi on January 23, Prime Minister of India, while Trump will deliver a keynote address before the close of the meeting on January 26, the WEF said. This year a record number of leaders from G7 economies will participate, including Paolo Gentiloni, Prime Minister of Italy; Jean-Claude Juncker, President of the European Commission; Emmanuel Macron, President of France; Theresa May, Prime Minister of the United Kingdom; and Justin Trudeau, Prime Minister of Canada, in addition to President Trump. Other leaders from the G20 countries would include Liu He, Member of Political Bureau and General Director of CPC Central Committee of the People's Republic of China; Argentina President Mauricio Macri, South Africa Deputy President Cyril Ramaphosa and Brazil President Michel Temer. From the host country, Alain Berset, President of the Swiss Confederation, will also participate. Overall, the summit will have over 340 top political leaders with 10 heads of state/government from Africa, nine from Middle East and North Africa and six from Latin America. These include Ethiopia Prime Minister Hailemariam Dessalegn, Zimbabwe President Emmerson Mnangagwa, Nigeria Vice President Yemi Osinbajo, Lebanon President Saad Al Hariri, Jordan King Abdullah II Bin Al Hussein, Israel Prime Minister Benjamin Netanyahu and Columbia President Juan Manuel Santos. The summit will also be attended by 40 arts and culture leaders, including Bollywood star Shahrukh Khan, Cate Blanchett and Elton John. One of the key issues to be discussed would be navigating a multipolar and multiconceptual world and the balance between global cooperation and local autonomy to prevent the disintegration of the world order. Besides, the leaders will also discuss how to overcome divisions in society and if outrage cycles in media and political rhetoric are widening societal fault lines and undermining tolerance, then what solutions can be jointly developed to restore the social compact, the WEF said.